Staphylococcus aureus (S. aureus), is responsible for many infectious diseases, ranging from benign skin infections to life-threatening endocarditis and toxic shock syndrome. Ortho-phenylphenol (OPP) is an antimicrobial agent and an active ingredient of EPA-registered disinfectants with wide human exposure in various agricultural, hospital and veterinary disinfectant products. Despite many uses, an understanding of a cellular response to OPP and it's mechanism of action, targeted genes, and the connectivity between targeted genes and the rest of cell metabolism remains obscure. Herein, we performed a genome-wide transcriptome analysis of the cellular responses of S. aureus when exposed to 0.82 mM of OPP for 20 and 60 min. Our data indicated that OPP downregulated the biosynthesis of many amino acids, which are required for protein synthesis. In particular, the genes encoding the enzymes of the diaminopimelate (DAP) pathway which results in lysine biosynthesis were significantly downregualted. Intriguingly, we revealed that the transcription of genes encoding ribosomal proteins was upregulated by OPP and at the same time, the genes encoding iron acquisition and transport were downregulated. The genes encoding virulence factors were upregulated and genes encoding phospholipids were downregulated upon 20 min exposure to OPP. By using microarray analysis that enables us to simultaneously and globally examine the complete transcriptome during cellular responses, we have revealed novel information regarding the mode of action of OPP on Staphylococcus: OPP inhibits anabolism of many amino acids and highly downregulates the genes that encode the enzymes involved in the DAP pathway. Lysine and DAP are essential for building up the peptidoglycan cell wall. It was concluded that the mode of action of OPP is similar to the mechanism of action of some antibiotics. The discovery of this phenomenon provides useful information that will benefit further antimicrobial research on S. aureus. The U.S. Environmental Protection Agency (EPA) has endeavored to determine the efficacy and the mode of action of antimicrobials. At EPA, 5,000 antimicrobial products are registered, and hospital-level disinfectants are being tested against pathogens such as S. aureus, which is responsible for many infectious diseases, ranging from benign skin infections to life-threatening endocarditis and toxic shock syndrome . One of the reasons EPA has exerted such efforts is that hospital-acquired infections are a serious threat to public health. Therefore, it is important to use appropriate antimicrobial agents with clear understanding of the subsequent effects to prevent infection outbreaks in health care environments . The phenolic compound, ortho-phenylphenol (OPP), is an antimicrobial agent and an active ingredient of EPA-registered disinfectant with wide human exposure in various agricultural, hospital and veterinary disinfectant products. OPP is employed in a variety of applications, including hard surface disinfection, wood preservation, treatment of citrus fruit, vegetables before packaging to prevent microbial decay and textile production due to its bactericidal and fungicidal activity [3–5]. There have been several reports related to the exposure of OPP on humans. It has been reported that OPP increased the incidence of urinary bladder tumors in F344/DuCrj rats when administered in the diet . The results of this study stimulated the initiation of additional testing of OPP for both tumor induction and possible reactivity with DNA. OPP has been found to have estrogenic or anti-androgenic activity, and binds to the androgen or estrogen receptors . In spite of these effects OPP is still used in applications that simultaneously contact both humans and bacteria. It is therefore important to understand the differential effects on each so that its efficacy can be understood and even optimized. Moreover, a lack of understanding of a cellular response to OPP hinders further development of more innovative methods for combating pathogens. Certainly, better elucidation of the molecular events responsible for establishing and maintaining pathogenicity will help to map affected cell functions and serve to delineate the mechanisms involved in the disinfectant activity. Microarrays have been effectively employed to simultaneously and globally examine the complete transcriptional response at the genomic level in Pseudomonas aeruginosa and S. aureus upon exposure to antimicrobials [8–15]. In this study, to our knowledge, for the first time, we show that the global transcription response of S. aureus to OPP includes downregulation of genes involved in lysine metabolism, as well as genes involved in amino acid metabolism, by utilizing Affymetrix S. aureus GeneChip arrays. Our findings indicate that: (i) many cellular protective processes were upregulated, (ii) the transcription of genes involved in primary metabolic pathways was downregulated, and (iii) the transcription of genes encoding lysine and histidine biosynthesis was downregulated. Next we performed real-time PCR analysis on selected genes to validate the array results. Based on this result, it was concluded that this study may help to elucidate the mechanism of action by which OPP stops cell wall construction and thereby inhibiting S. aureus growth, and may facilitate the design of more effective antimicrobials. To determine the sublethal inhibitory effect of OPP on S. aureus, we first exposed the exponentially growing cells to different concentrations of OPP dissolved in DMSO (0 up to 1.18 mM). In figure 1, we demonstrate that 0.82 mM concentration of OPP caused a growth inhibition for about 20 min. Note that minimum inhibitory concentration (MIC50) of OPP on S. aureus was reportedly 500 mg/l (3 mM) . In this study, to better understand how S. aureus initially responds to OPP, we chose the rate of cell growth inhibition with 0.82 mM OPP after 20 and 60 min exposure times compared to control (without OPP). S. aureus growth (optical density at 600 nm) after treatment with OPP: control (open triangles ), with DMSO ( closed triangles ), 0.71 mM ( inverted closed triangles ), 0.82 mM ( closed circles ), 0.94 mM ( open squares ), and 1.18 mM OPP ( X ). 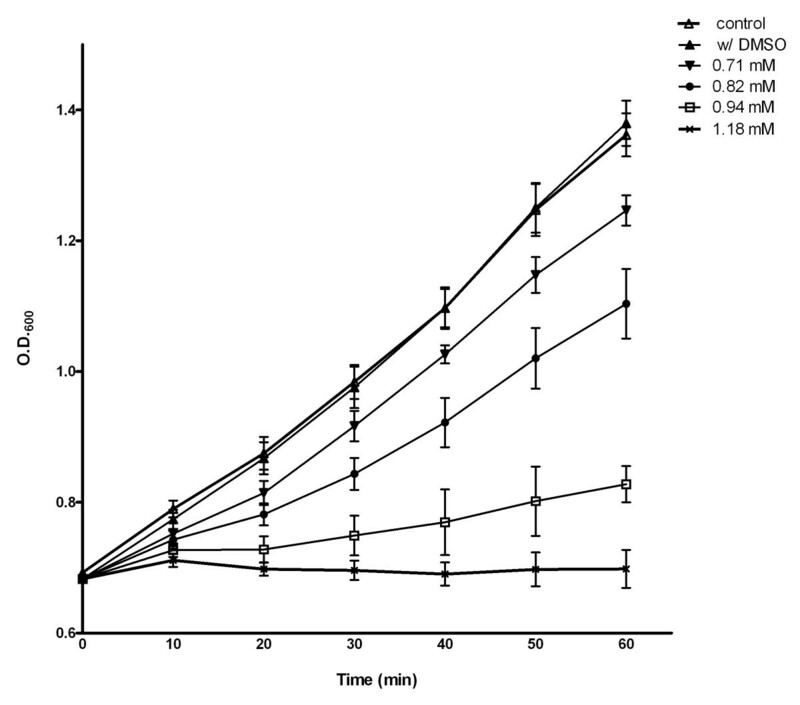 Growth inhibition was performed during the exponential phase of the cells without DMSO (control) and control with DMSO, 0.71 mM, 0.82 mM, 0.94 mM, and 1.18 mM OPP dissolved in DMSO. The results are the mean of triplicate experiments; the error bars represent standard deviation. To investigate early transcriptional changes in response to OPP exposure, we isolated total RNA after 20 min and 60 minutes exposure to 0.82 mM OPP and conducted five independent microarray experiments in the absence (control) and the presence (experimental) of 0.82 mM OPP (see figure 1). To further identify genes with statistically marked changes in expression levels, we applied the following criteria to each of the 20 min, 60 min, and control-experimental microarray data sets: (i) a p- value for a t-test should be equal to or less than 0.05, (ii) an absolute fold change in transcript level should be equal to or greater than 2, and (iii) a gene should have a presence or marginal call  from 50% or more replicates on both the experimental and control replicate sets. Of the 7,775 genes represented on the S. aureus GeneChip, 2,348 genes showed statistical significance based on a 1-way ANOVA. We found that mRNA levels 669 genes of S. aureus were significantly altered in response to OPP by two fold or more upregulation or downregulation. The raw data of 7,775 genes control (0 min) and experimental genes after (20 and 60 min exposure to 0.82 mM of OPP) has been deposited in NCBI's Gene Expression Omnibus  and is accessible through GEO Series accession number GSE10605 (Additional file 1). To examine how genes with transcript level changes are distributed with regard to their functions, we further classified these 669 genes that were either upregulated or downregulated by a fold change of two or more according to the Gene Classification based on COG functional categories in the genome of National Center for Biotechnology information (NCBI)  (see also Additional file 2). In Figure 2, the differences between the numbers of up and downregulated genes in each functional class after 20 and 60 minutes exposure to 0.82 mM of OPP are illustrated. Note that Figure 2 represents a total of 669 genes including the group of "function unknown (36), hypothetical protein (132) and general function predicted only (70)". Some interesting findings are as follows: (i) the genes of amino acid transport and metabolism were highly downregulated at both 20 and 60 min; (ii) the genes of inorganic ion transport and metabolism were downregulated at 20 min and decrease in the number of genes downregulated at 60 min was also observed; (iii) the genes in the class of "translation, ribosomal structure and biogenesis" were significantly upregulated at 20 min; (iv) the number of genes involved in nucleotide transport and metabolism were increased after 20 min compared to after 60 min. In general, figure 2 illustrates that the functional classes contained more downregulated and fewer upregulated genes at 20 min. This result suggests that the functional class profiles were notably different between 20 and 60 min, and this difference might explain why S. aureus underwent the initial growth inhibition followed by partial growth recovery upon exposure to OPP. Functional classification of genes with statistically significant upregulated ( red ) and downregulated ( green ) when exposed to 0.82 mM OPP at 20 min and 60 min (a total of 669 genes). The number in parenthesis represents the total number of genes affected within the genome in each functional class. To further identify genes with similar transcription patterns during the time course, we removed 238 genes (including the group of functional unknown (36), hypothetical protein (132) and general function predicted only (70)). We categorized 431 genes with known functions into 6 groups on the basis of their transcription directions (figure 3). Briefly, group I contained 23 genes upregulated upon both exposure times, while group II had 80 genes with increased expression levels at 20 min and no significant changes upon 60 min exposure. Further, group III possessed 26 genes that were upregulated at 60 min exposure. 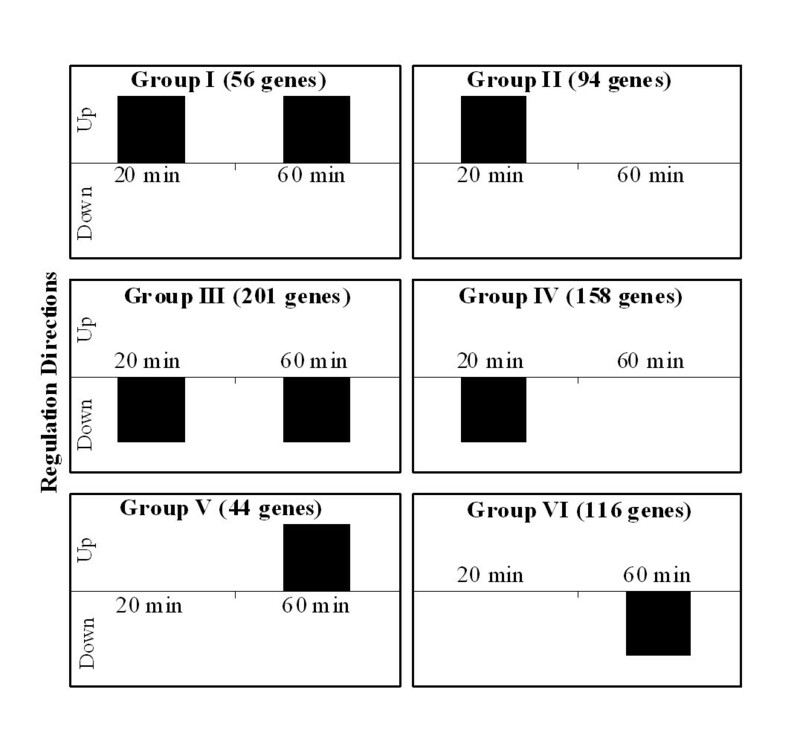 Group IV contained 128 genes downregulated upon both exposure times, whereas 95 genes of group V exhibited downregulation after 20 min. Finally, group VI had 79 genes that were downregulated upon 60 min exposure. Figure 4 displays the number of genes (431) within groups I through VI in each functional class. As indicated above, additional file 2 contains all 669 genes including the genes classified under the functional group designated as "unknown, hypothetical, and general function prediction only". Groups of differentially regulated 431 genes with known functional class, which are categorized by their transcription directions upon 20 and 60 min exposures. Group I contained 23 genes upregulated upon both exposure times, while group II had 80 genes upregulated at 20 min and no significant changes upon 60 min exposure. Further, group III possessed 26 genes that were upregulated in response to 60 min exposure. Group IV contained 128 genes downregulated upon both exposure times, whereas 95 genes of group V exhibited downregulation after 20 min exposure. Finally, group VI had 79 genes that were downregulated upon 60 min exposure. Functional classification of genes with statistically significant upregulated ( red ) and downregulated ( green ) upon 20 min and 60 min exposures (a total of 431 genes). Note that the functional classes of "hypothetical genes", "general function prediction only" and "function unknown" are not included in this figure. List of 138 S. aureus genes that were most strongly affected by OPP and are discussed in this report categorized by their related function. The microarray results are the mean of five replicates of each gene. * Genes were validated by real-time PCR. Group I of table 1 contains 18 genes associated with virulence in S. aureus. Interestingly, five of these genes encode the secretory antigen precursor, SsaA. The ssa A gene potentially regulated by the YycG/YycF system encodes proteins involved in cell wall metabolism, membrane-bound transport systems, and pathogenicity, including two major antigenic proteins, SsaA and IsaA. YycF has also been shown to bind specifically to the promoter regions of two genes, encoding the IsaA antigen and the LytM peptidoglycan hydrolase. This is in agreement with the proposed role of this system in controlling virulence and cell wall metabolism . In this study, OPP also upregulated the clf B (clumping factor B) gene expression upon both 20 and 60 min exposure. In our previous results, triclosan upregulated the expression of SA2423 encoding ClfB, which binds fibrinogen . The results of this study show that the production of virulence factors in S. aureus may be a secondary effect of OPP and this may provide new insight into the protective response of S. aureus to OPP. Group II of table 1 indicates that the class of "translation, ribosomal structure and biogenesis" which is responsible for the synthesis of ribosomal proteins was upregulated after 20 minutes. In group II of table 1, for instance four genes encode 30S ribosomal proteins and 15 genes code for 50S ribosomal proteins. In addition, SA0459 (rplY) which encoded general stress protein was upregulated at 20 min. Ribosomal proteins are required for protein translation. Such early response of these ribosomal protein genes may reflect a stress response during exposure. The upregulation of ribosomal protein genes might enhance the translation process or help proper ribosome functioning under stress conditions as exposure to OPP. The suggestion that the expression of ribosomal proteins is activated upon exposure to OPP is surprising as this presumably reflects increased growth rate or virulence. In group II (table 1), we also observed genes related to primary metabolism that mainly belonged to the functional classes of "purines, pyrimidines, nucleosides, and nucleotides". The gene cluster: SA1041–SA1048 (pyr RPBCAAABFE) which is homologous to the pyrimidine biosynthetic (pyr) operon of Bacillus subtilis  was upregulated at 20 min. In group III of table 1, there were some genes from amino acid transport and metabolism, an ATP-binding cassette (ABC) transporters and transcription. The oligopeptide transport system (Opp) of S. aureus is an ABC transporter that transports amino acids, cations- and iron-carrying compounds and peptides with a broad specificity . The peptides are mainly used as nutrients by the multiple amino acid auxotrophic S. aureus. The Opp system consists of four different proteins: OppB and OppC, OppD and OppF. Interestingly, 4 of the 26 genes, including SA0845–SA0848 that code for proteins associated with amino acid transport were upregulated (table 1). Therefore, the suggestion that the expression of these proteins is activated upon exposure to OPP is surprising as this presumably reflects increased growth rate or recovery. We found that a putative operon containing four open reading frames (ORFs) (pot ABCD) was upregulated (table 1). The pot ABCD operon encodes a periplasmic binding protein dependent ABC transport systems from Gram-positive bacteria . The SA0950–SA0952–SA0953 shows homology to the genes encoding this pot ABCD transport system (pot A, pot C and pot D), which are involved in the transport of spermidine and putrescine. Further, we showed the upregulation of ABC transport systems-related genes, which accompanied the growth recovery. Of further importance was that group III contained genes related to integral membrane protein, which belonged to the functional class of "cell division and chromosome partitioning". SA1601 (crc B) is a putative integral membrane protein possibly involved in chromosome condensation (table 1). In group IV in table 1, we noted that genes belonging to the functional classes of "amino acid transport and metabolism", "carbohydrate transport and metabolism", "energy production and conversion", "posttranslational modification protein turnover chaperones", "transcription" classes and putative lipoproteins were downregulated upon both exposure times. Intriguingly, we observed the high downregulation of SA2149 and SA2150 (hrt A and B), the heme-regulated transport system, which consist of a novel transport system which plays a critical role in staphylococcal heme metabolism (table 1). Among the genes in the class of "amino acid transport and metabolism", SA1225 (lys C)-SA1226 (asd)-SA1227 (dap A)-SA1228 (dap B)-SA1229 (dap D), and SA1814 (dap E) fall within a predicted operon and are all involved in diaminopimelate (DAP) biosynthesis (table 1). The disruption of biosynthetic pathways involved in building up bacterial cell wall components is a common mode of action of antibiotics . Penicillins , methicillin , cephalosporins  and glycopeptide drugs such as vancomycin  are all drugs that inhibit major steps in the construction of the peptidoglycan layer of bacterial cell walls. Lysine or its biosynthetic precursor, DAP , are essential to most bacteria for the synthesis of the peptidoglycan layer of the cell wall [30–33]. Since mammals neither make nor use DAP and require L-lysine is an essential amino acid that is supplied through dietary intake, inhibitors of the DAP biosynthetic pathway will probably not result in mammalian toxicity. Decisively SA1225 (lys C)-SA1226 (asd)-SA1227 (dap A)-SA1228 (dap B) and SA1229 (dap D) show fold highest decreases as -54.6, -21.5, -27.3, -31.4, and -23.5 folds at 20 min and -7.7, -4.3, -5.2, -5.1, and -4.4 folds at 60 min in this experiment (see also table 2). Our findings suggest that the mode of action of OPP may be related to bacterial biosynthesis of amino acids. Other genes of amino acids, including methionine, threonine, histidine and lysine were also highly down regulated at -15, -7, -19 and -54 folds. Therefore, this outcome in conjunction with the extensive downregulation of the genes encoding DAP biosynthesis suggests that OPP may inhibit construction of the peptidoglycan in cell wall of S. aureus. These genes were less downregulated at 60 min than at 20 min. These results suggest that OPP inhibits the growth of S. aureus at 20 min and that growth recovery occurs at 60 minutes, indicating a possible mechanism of action of OPP in S. aureus. 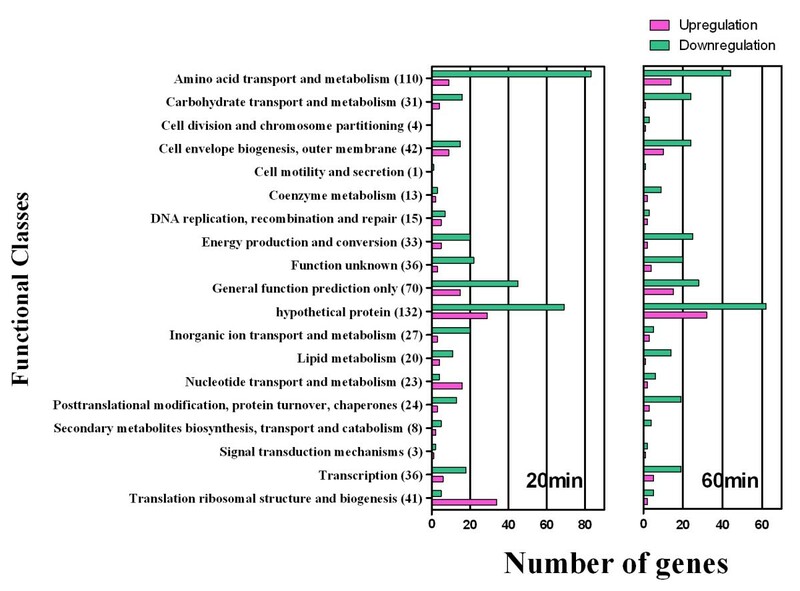 In a similar study carried out using Pseudomonas aeruginosa treated with 0.82 mM OPP, we did not observe extensive downregulation of the genes involved in amino acid biosynthesis and specifically lysine biosynthesis (data not shown). This suggests that the mechanisms of action of 0.82 mM OPP on P. aeruginosa and S. aureus may differ. Transcript level comparison of S. aureus genes between real-time PCR and microarray analyses. The real time PCR results are the mean of three biological replicates with three technical replicates for each gene. The microarray results are the mean of five replicates of each gene. aSA0727 was glyceraldehyde 3-phosphate dehydrogenase (GAPDH) and used as the house-keeping gene. bSA2464, SA2465, SA2466, and SA2468 were downregulated at 20 min with no change at 60 min. cSA2459, SA2460, and SA2461 were downregulated after 20 min and upregulated after 60 min exposure. Additional amino acid biosynthesis genes including: SA1164 (dho M)-SA1165 (thr C)-SA1166 (thr B) involved in threonine biosynthesis were also in this group (table 1). Further, SA2082–SA2083–SA2084–SA2085–SA2086–SA2088 (ure ABCEFD), which make CO2 and NH3 from urea and encode urea amidohydrolase and urease accessory proteins and SA1544 which codes for serine-pyruvate aminotransferase were downregulated at 20 and 60 min (table 1). Group IV of table 1 also shows that the functional class of "cell envelope biogenesis, outer membrane" was distinctive. In particular, SA1231 which shows an -18-fold decrease after 20 min encodes an alanine racemase that catalyses the conversion of L-alanine into D-alanine, a key component of bacterial peptidoglycan . Additionally, the putative lipoproteins: SA0229 (dpp A), SA1213 (opp- 2C)-SA1214 (opp- 2B), SA1659 (prs A), SA2235 (opu CC), and SA2409 which are cell wall anchoring surface proteins were downregulated in response to OPP (table 1). 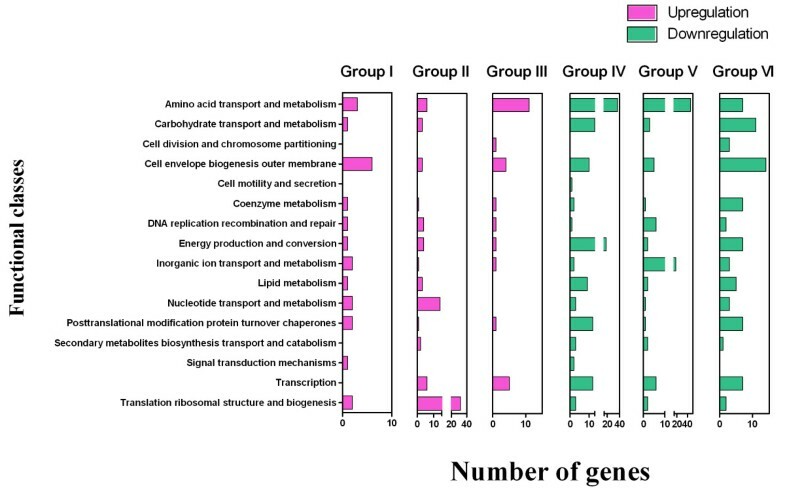 In group IV, we also observed genes related to primary metabolism that mainly belonged to the functional classes of "energy metabolism", "lipid metabolism", and "transcription". For example, cytochrome bd complex: SA0937–SA0938 (cyd AB) was downregulated upon both 20 min and 60 min exposure (table 1). Cytochrome bd complex is one of two terminal oxidases in the bacterial respiratory chain that reduce molecular oxygen to water, utilizing intermediates shuttled through the electron transport chain . Cytochrome d oxidase catalyses the last step of oxygen respiration and prevails under oxygen-limiting conditions . Interestingly, it was speculated that cytochrome d oxidase is required under conditions of environmental stress and may have crucial roles in cellular physiology other than acting as an oxidase . However, prior studies revealed that the cyd AB genes were strongly upregulated upon exposure to hydrogen peroxide strengthens the confidence of the prior assignments about the role of cytochrome d oxidase in oxidative protection processes of both Gram positive and Gram negative bacteria [10, 13]. In group V in table 1, the most dominant class was "amino acid transport and metabolism", which contained half of the genes in that group. Further, SA1858 (ilv D)-SA1859 (ilv B) and SA1861 (ilv C)-SA1862 (leu A)-SA1863 (leu B)-SA1864 (leu C)-SA1865 (leu D)-SA1866 (ilv A) which were downregulated (table 1) are possibly parts of an operon homologous to the ilv-leu operon encoding enzymes of branched-chain amino acid biosynthesis in Bacillus subtilis . In addition, SA2464 (his I)-SA2465 (his F)-SA2466–SA2467 (his H)-SA2468 (his B)-SA2469 and SA2472 (his Z) which are possibly parts of an operon homologous to the histidine biosynthesis were highly downregulated on 20 min (table 1). SA1200–SA1201 (trp D)-SA1202 (trp C)-SA1203 (trp F)-SA1204 (trp B)-AS1205 (trp A) which are also possibly parts of an operon homologous to the tryptophan biosynthesis operon are downregulated on 20 min (table 1). This result along with the downregulation of 46 genes involved in amino acid biosynthesis in group V suggests that amino acid synthesis was repressed upon 20 min exposure to OPP in S. aureus. Group V shows that 17 genes in the functional class of "inorganic ion transport and metabolism" were downregulated at 20 min. First, SA0771 (met Q) codes for probable D-methionine-binding lipoprotein (outer membrane lipoprotein 1). The proteins encoded by SA0344 (met E)-SA0769 (met N)-SA0770 (met I)-SA0420 (met N)-SA0421 (met I) are involved in D-methionine transporter of S. aureus ABC transporter (table 1). Interestingly, group V contained lipoproteins such as SA0010, SA0331, SA0849, SA0850, SA0201 and SA1211 (table 1). These results, along with downregulation of all the genes of lipoproteins of S. aureus in group IV and V, suggest that OPP exposure may decrease stability of the staphylococcal membrane. Secondly, the proteins encoded by SA2475 (cbi Q)-SA2476 (cbi O) are involved in cobalt and nickel transport (table 1). Table 1 illustrates that the functional classes of group VI in general contained more downregulated genes at 60 min. In particular, the functional classes of "cell envelope biogenesis outer membrane", "carbohydrate transport and metabolism", "amino acid transport and metabolism", "coenzyme metabolism", "energy production and conversion" and "posttranslational modification protein turnover chaperones" had significantly more downregulated genes at 60 min (see also figure 4). This result suggests that the functional class profiles were notably different between 20 and 60 min. One of the characteristics of group VI of table 1 was the downregulation of 12 genes belonging to the functional class of "cell wall/membrane/envelope biogenesis". In particular, genes related to envelope biogenesis were distinctive: SA0144 (cap A)-SA0145 (cap B)-SA0146 (cap C)-SA0147 (cap D)-SA0148 (cap E)-SA0149 (cap F)-SA0150 (cap G)-SA0151 (cap H)-SA0152 (cap I)-SA0154 (cap K) were downregulated at 60 min. These genes share homology with the capsular polysaccharide synthesis enzyme (cap) operon which in turn is essential for virulence by impeding phagocytosis . This finding is congruent with the previous outcome that triclosan downregulates several virulence factor-related genes (SA0144–SA0153 (cap ABCDEFGHIJ)) in S. aureus . Moreover, IsdAC encoded by SA0977 and SA0978, the iron-regulated surface determinant (Isd) system, was downregulated at 60 min (table 1). Identification of the Isd system in S. aureus has demonstrated the importance of cell-wall sorted proteins in heme binding and transport . To date, the Isd system comprises the only known heme-iron utilization pathway in S. aureus. Cell-wall sorted proteins of the S. aureus iron-regulated surface determinant system bind human hemoproteins, remove the heme molecule, and transport heme through the cell wall and plasma membrane for accumulation in the bacterial cytoplasm . Particularly important was that many of the genes in the class of "coenzyme metabolism" were also members of group VI (figure 4 and table 1). Intriguingly, the genes were all involved in the riboflavin biosynthesis. SA1586 (rib H)-SA1587 (rib A)-Sa1588 (rib B)-SA1589 (rib D) was downregulated at 60 min exposure (table 1). Riboflavin (vitamin B2) is an essential component of the basic metabolism, being a precursor of coenzymes flavin adenine dinucleotide (FAD) and flavin mononucleotide (FMN). The best studied system of the riboflavin biosynthesis in bacteria is the rib operon of Bacillus subtilis encoding a pyrimidine deaminase/reductase, α-subunit of riboflavin synthase, GTP cyclohydrolase/3,4-dihydroxy 2-butanone 4-phosphate (3,4-DHBP) synthase, and β-subunit of riboflavin synthase . These enzymes form a pathway that creates one riboflavin molecule from one molecule of GTP and two molecules of ribulose 5-phosphate . The proteins encoded by SA1894 (thi E)-SA1895 (thi M)-SA1896 (thi D) were involved in thiamine biosynthesis of coenzyme metabolism at 60 min (table 1). Methicillin-resistant S. aureus small colony variants are frequently auxotrophic for hemin, menadione, thiamine, and CO2 involved in biosynthesis of the electron transport chain element. This phenotype grows slowly, and forms very small, nonhemolytic colonies in routine culture, so it may lead to the misidentification of this organism. As discussed above, group IV also had SA2149 (hrt A)-SA2150 (hrt B), which exhibited expression level decreases upon 20 and 60 min exposures in chorus with the repression of the genes of thiamine biosynthesis. Therefore, this result suggests that growth inhibition was accompanied with the repression of many coenzyme metabolism-related genes. Note that group VII has been included only in table 1 in order to discuss the aberrant behaviour of the ica genes. Group VII is not indicated on figure 3 and 4. Intriguingly, we observed that SA2459, SA2460 and SA2461 (ica ADB) which make up the intercellular adhesion (ica) operon and contribute to virulence in S. aureus were downregulated after 20 min and upregulated after 60 min of exposure to OPP (table 1 and table 2). The intercellular adhesion operon (ica RADBC) mediates polysaccharide intercellular adhesion in S. aureus, which leads to cell-cell adhesion and is required for biofilm formation  Prior studies have demonstrated that polysaccharide intercellular adhesin/hemagglutinin production is involved in the pathogenesis of S. epidermidis [45, 46], and is also upregulated by subinhibitory concentrations of certain antibiotics . Therefore, this finding proposes that biofilm formation may not occur after 20 min of exposure to OPP but is possibly favoured as a protective response as exposure time increases to 60 minutes. As an independent measure of differential gene expression, we examined the relative levels of 18 genes with a range of fold changes (-265.0- to 24.5-fold) by real-time PCR analysis, which were specifically involved in the pathogenesis or metabolism of S. aureus. Table 2 shows that our microarray results were corroborated with real-time PCR analysis, which provides independent verification of transcript level changes of the genes that we discuss in this report. In this paper, we demonstrated how OPP upregulated and downregulated genes in S. aureus, for the first time, by utilizing whole-genome microarrays. Moreover, we presented how the transcriptome profile of S. aureus was shifted during its cellular response to OPP, which involved the growth inhibition. To our knowledge, this is the first study demonstrating the activation of fermentative metabolism after OPP treatment in S. aureus. In summary, we revealed that amino acid metabolism genes were selectively downregulated between 20 and 60 minutes when exposed to 0.82 mM OPP. We also found that the growth inhibition was accompanied by the downregulation of many membrane function-related genes; however, the majority of these genes returned to normal transcription levels during the growth resumption. Further, we showed that the repression of the iron-regulated surface determinant (Isd) system, hemin and thiamine-related genes accompanied with the growth inhibition. Notably, we discovered the upregulation of virulence genes and ribosomal genes while the cells returned to normal growth. These results suggest that S. aureus might be arrested upon exposure to OPP. In this study, OPP treatment led to the downregulation of several genes involved in amino acid anabolism. The genes involved in the DAP and lysine biosynthetic pathways were most significantly downregulated. Lysine and DAP are essential for building up the peptidoglycan cell wall. This finding proposes that the mode of action of the antimicrobial, OPP in S. aureus might be attributed to the inhibition of genes of lysine biosynthesis and subsequently peptidoglycan biosynthesis. We can therefore, conclude, that the mode of action of OPP is similar to the mechanism of action of some antibiotics. This study has revealed novel information on the mechanism of action of OPP in S. aureus which will benefit further antimicrobial research on S. aureus. In this study, we used S. aureus NCTC 8325 obtained from the Network on Antimicrobial Resistance in S. aureus (NARSA). As previously described [10–12], we initiated and maintained S. aureus cultures at 37°C with shaking at 250 rpm using sterilized Lurria-Bertani (LB) broth. For growth inhibition, 0.14 mg/L (0.82 mM) of OPP (Aldrich Chemical Co., St. Louis, MO) was dissolved in DMSO and used for the microarray study and added immediately after OD600 reached 0.8. OD600 was measured by using Lambda 25 spectrophotometer (PerkinElmer, Inc., MA). Note that the pH of S. aureus cultures was around 7.0 at 37°C after the exposure . Total RNA was isolated after 20 and 60 min incubation with and without (control) OPP using the RiboPure – Bacteria kit (Ambion, Inc., Austin, TX) . The quantity of eluted RNA was determined using the NanoDrop spectrophotometer (NanoDrop Technologies, Inc., Wilmington, DE). RNA 6000 Nano LabChip with an Agilent 2100 Bioanalyzer (Agilent Technologies, Palo Alto, CA). cDNA synthesis, cDNA fragmentation, labeling, hybridization, staining and washing steps were performed according to the manufacturer's protocol for the Affymetrix S. aureus GeneChip arrays (Affymetrix, Inc., Santa Clara, CA). The arrays were scanned with the Affymetrix GeneChip Scanner 3000. To analyze the array data, GeneChip Operating Software (GCOS) v. 1.2 (Affymetrix, Inc., Santa Clara, CA) and GeneSpring GX v. 7.3 (Agilent Technologies, Inc., Santa Clara, CA) were utilized with the following parameters: alpha 1, 0.04; alpha 2, 0.06; tau, 0.015; target signal, 500. Fold changes were calculated as the ratio between the signal averages of five biological controls (untreated) and five biological experimental (OPP-treated) for 20 and 60 min exposures. To determine the validity of the array data, transcript level changes obtained with the microarray analysis were compared with those from quantitative real-time PCR. Genes and primer sequences employed for the real-time PCR analysis are listed in table 2. The housekeeping gene, glyceraldehyde 3-phosphate dehydrogenase (GAPDH), was used as an endogenous control. The real-time PCR was performed by employing iCycler iQ Real-Time PCR Detection System with iScript cDNA Synthesis Kit and IQ SYBR Green Supermix (BioRad Laboratories, Inc., Hercules, CA). For each gene, three biological replicates with three technical replicates each were employed. Reaction mixtures were initially incubated for 3 min at 95.0°C, followed by 40 cycles of 10 s at 95.0°C, 30 s at 55.0°C, and 20 s at 72.0°C. PCR efficiencies were derived from standard curve slopes in the iCycler software v. 3.1 (BioRad Laboratories, Inc., Hercules, CA). Melt-curve analysis was also performed to evaluate PCR specificity and resulted in single primer-specific melting temperatures. In this report, relative quantification based on the relative expression of a target gene versus GAPDH gene was utilized to determine transcript level changes. This research is supported by the United States Environmental Protection Agency Grant number T-83284001-1. Although the research described in this paper has been funded wholly by the United States Environmental Protection Agency, it has not been subjected to the Agency's peer and administrative review and therefore may not necessarily reflect the views of the EPA; nor does the mention of trade names or commercial products constitute endorsement of recommendation of use. HJ performed microarray experiments, and data analysis, and drafted the manuscript. FT initiated and supervised the study, and reviewed the manuscript. CN and WEB reviewed the manuscript.